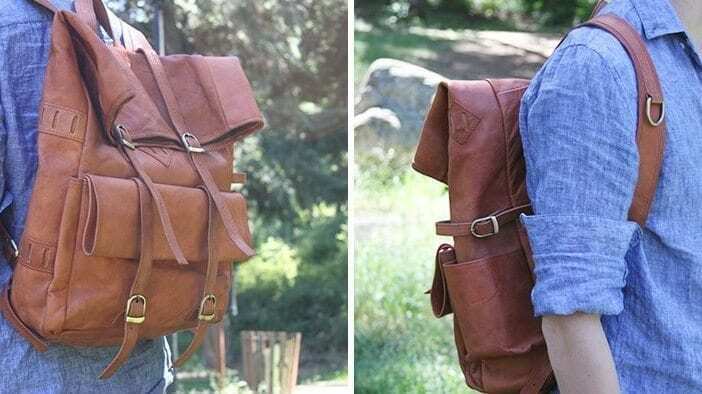 Jaunji Designs, a small design studio out of Vancouver, British Columbia, recently launched a Kickstarter campaign for their new Explorer Bag. 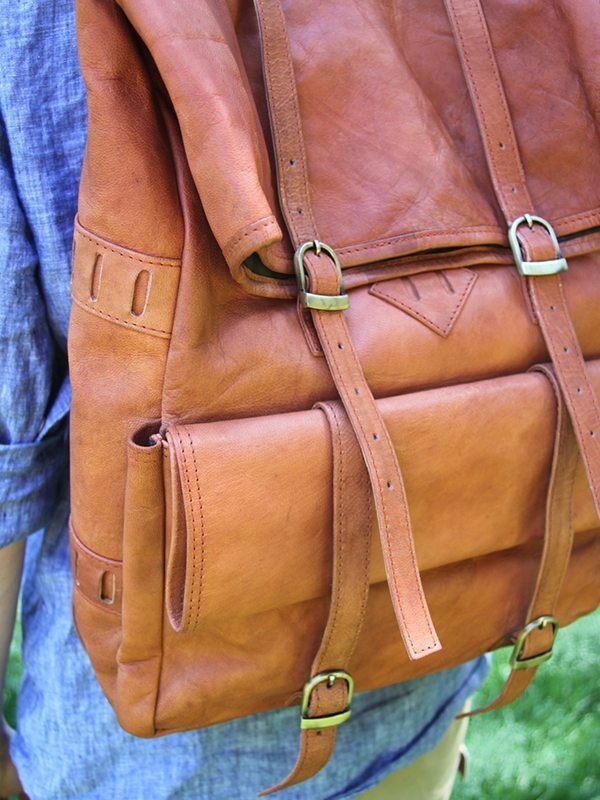 We got our hands on one of these Explorer bags a few months ago. The version we received was a prototype and it seems that a few things have already been improved since that time. Here are our thoughts on the Jaunji Designs Explorer Rolltop Backpack. “We are a quality driven lifestyle brand and we believe that our designs/products should be simple, functional and lasting – We will never settle for anything less! Our team compasses decades of experience in the creative and design fields. We strive to design with functional features and use the best materials available. Our aim is to create products that make everyday life more enjoyable. 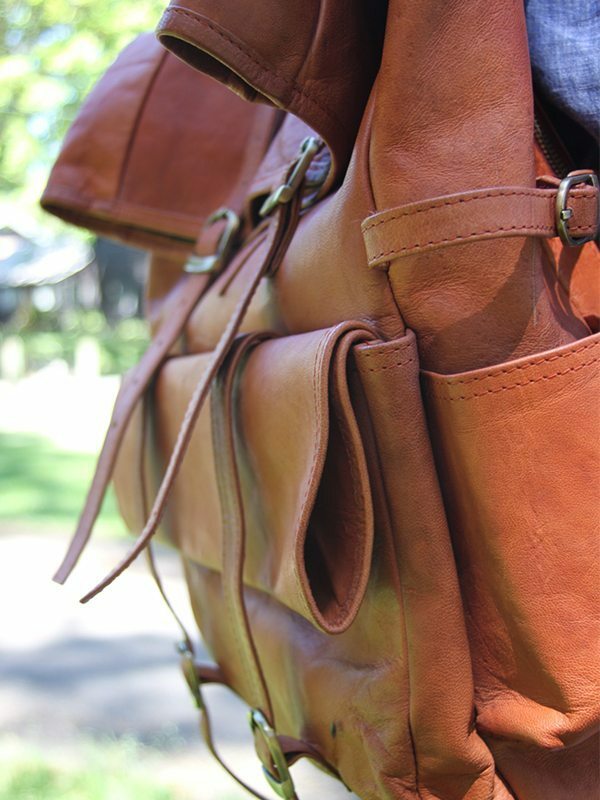 The Explorer Rolltop Backpack is made of vegetable tanned full grain goat leather. Goat leather is naturally water resistant, making it useful for everyday products. Goat leather is softer than some of the other leathers due to the presence of lanolin wax. Goat hide is lighter than cowhide and is more supple requiring little break in time. The downside is that it can be less sturdy – some of the leather on the closure straps stripped off upon my first real use of the bag because there is not much room for the straps to slide through the hardware. It is, however, reinforced at the seams and stress points like the buckle closures. In addition, some of the stitching around the mouth is a bit uneven, but not noticeable unless you’re looking closely. Previous experience with goat leather from some of our reviewers has elicited comments about adverse smells from the tanning process. In this case, the Explorer pack does not emit an adverse odor at all, which is great. The texture and color of the goat leather is great and it will definitely darken with time and use to develop a unique patina. The Explorer features brass YKK zippers and brass finished metal hardware. The metal hardware hasn’t failed on me but it feels a little light weight. Again, this could be due to the fact that this is a prototype and hardware choices may have changed and been upgraded since then for the production pieces. The top closure straps run right over the shoulder straps when the top is open, making for a very ergonomic and natural design. There’s lots of padding in the main section of the bag, enough to protect fragile cameras or electronics. There’s also a padded laptop sleeve. The straps and fit of the bag feels comfortable on my shoulders, even when relatively full of stuff. The straps are thick and padded, making them quite comfortable and less of a hassle to put on. There is a slot pocket for an umbrella, as well as several lash points for other gear on the bottom and main body of the bag. 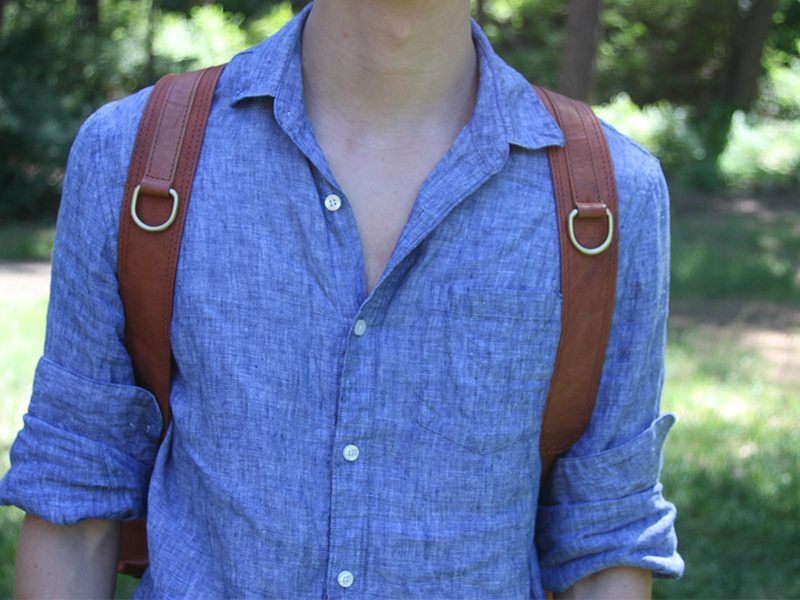 These tie-down points and straps make the bag very customizable for whatever purpose you have in mind. The rolltop makes the bag expand from 14″ to 20″ inches, so it can fit quite a lot if you need it to. I hope Jaunji Designs will come out with matching straps that can be used to accessorize the Explorer in time. The interior is lined with a thick, medium brown colored fabric. It feels good to the touch and will certainly aid in protecting whatever treasures you store inside of it. It does create a dark cavern, so you’ll need to fish inside for your items, but that’s pretty normal for most backpacks of any style. The quick access document/tablet pouch is a nice touch. It’s secure, but quickly accessible due to the large zipper on the pack. Everyone likes the look of this bag; I get compliments on it from everyone who has seen it. Jaunji Designs pulled off the rolltop look very well. The bag tapers nicely and doesn’t look scrunched; it’s definitely an ideal and classic design that can open up or be strapped down however you like. The Jaunji Designs Explorer Rolltop Backpack is very aesthetically pleasing and its Kickstarter price is right. There are still a few spots left on the Kickstarter campaign. The Explorer is extremely aesthetically pleasing and its design is quite useful. You shouldn’t plan on it lasting you forever, but $175 is a reasonable price for a great looking bag that you’ll enjoy and find useful for several years to come.